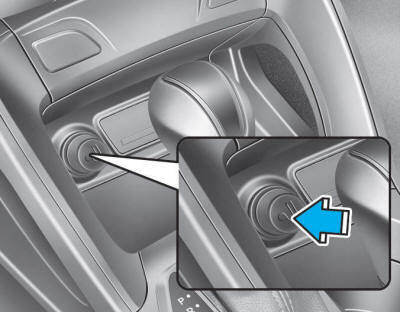 To use the cigarette lighter, the ignition switch must be in the ACC position or the ON position. To open the cover, press the cover and it will slowly open. Then push the cigarette lighter all the way into its socket. When the element has heated, the lighter will pop out to the “ready” position. If it is necessary to replace the cigarette lighter, use only a genuine HYUNDAI replacement or its approved equivalent. Do not hold down the cigarette lighter while it is heating. It may overheat and damage the lighter or the heating element. Do not use the cigarette lighter for accessories (shavers, handheld vacuums, and coffee pots, etc.). The use of plug-in accessories may damage the socket or cause electrical failure. Use the power outlets for this purpose.